These chairs are lovely. The black seat makes the chair extra special as well as the way the legs on chair were carved. Lookinh forward to completing the set needed for the matching table i bought as well. Timeless craftsmanship comes to life in the Chatham Downs collection. Crafted exclusively from solid mango wood, each heirloom quality piece features hand-planed surfaces, hand-turned legs and a moisture-resistant catalyzed finish. 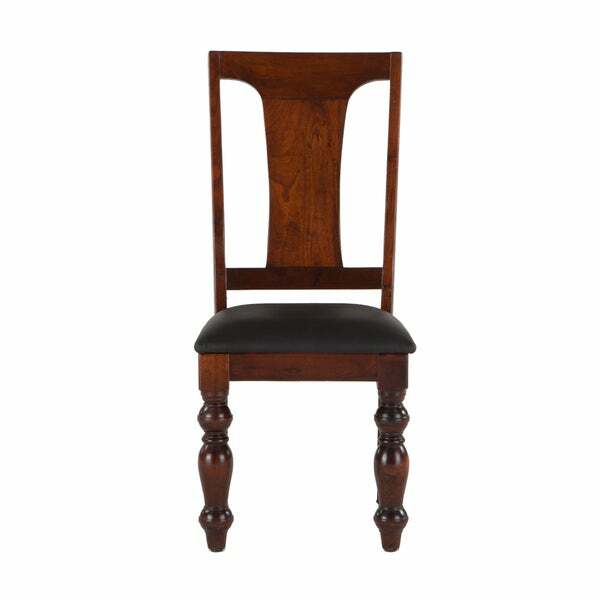 This beautiful dining chair with brown mahogany finish pairs perfectly with our Chatham Downs dining tables, and is a beautiful complement to any solid wood or mixed media dining room. The heirloom quality construction enhances the durability and beauty of the chair, while the presence of natural wood knots and distressed markings bring out the distinct characteristics of this wood, making no two pieces the same. Upholstered in faux black leather, this chair brings a simple elegance to any dining room. Dimensions 20.75 In. X 19.13 In. X 42.0 In. One came broken but O made good! Love this set! High quality and beautiful. I love the chairs! They are a good quality product that matches my table perfectly. The chairs arrived on time and were very well packed.